Click on the model to go directly to it or simply scroll down the page to get in depth descriptions about Bettinsoli's range of Shotguns. Call us for the most unbeatable price not just on Bettinsoli but any of our new shotguns. Britains best value shotgun, the Bettinsoli 28" multichoke is extremely popular with game and clay shooters alike. 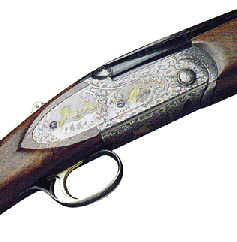 The gun is attractively game scene engraved and is supplied in a hard case and a velour slip for both barrels and stock. The 28" barrels are chrome lined and multi-choked with 5 chokes supplied. The barrels have 3" steel shot proofed chambers and are fitted with a 10mm sporting rib.The walnut chequered stock and forend are oil fininshed.The stock is fitted with a 17mm new pro-file recoil pad. 28" & 30" & 32"